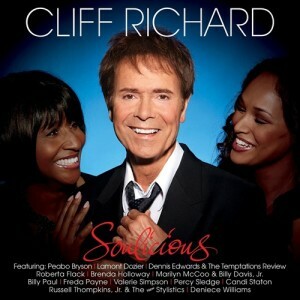 A new album from Cliff Richard will hit the stores in October in two versions. The album that contains soul duets will be followed by a tour in United Kingdom where several guest stars will join him in singing songs from the new album as well as many of his previous hits. Double Eurovision Song Contest participant Cliff Richard has for decades been such a well known international name that few of his fans think about that he represented United Kingdom at the Eurovision Song Contest in 1968 with Congratulations that came second and later in 1973 with Power To All Our Friends, which gave him a third place. Despite turning 70 last year and the fact that he has released so many albums that they almost are uncountable Cliff Richard is still going strong. He has sold more than 250 million records and more will undoubtedly be added when Soulicious – the soul album is being released on the 12th of October. The album contains 15 soul duets and will be released in two versions; as a regular album and as a box set containing a poster as well as a puzzle together with the album. For Sir Cliff himself there is an extra bonus to be achieved if he manage to get just one of these songs on the British chart. Currently he shares a record with Elvis Presley as the only ones who have managed to get singles on the British chart in all their active years. As Elvis died in 1977 it is however significantly more decades for Cliff Richard who has been active since the 50’s. If he makes it to the chart again he will have had new singles on this chart in amazingly seven decades. To accomplish this new album Cliff goes on tour. Eight concerts in England are scheduled so far. On this tour several of the ones he sings duet with on the album will join him. This involves Lamont Dozier, Freda Payne, Marilyn McCoo & Billy Davis, Jr. and Percy Sledge. Aside from those James Ingram and Jaki Graham will also appear as guest acts. 07. Oh How Happy – with Marilyn McCoo and Billy Davis, Jr.
For Cliff Richard duets is something he has been doing a lot before. At one of these occasions he recorded two songs together with the 2000 Eurovision Song Contest winners Olsen Brothers. This new album with soul duets can already be pre-orded. You find links below to make sure you get it as soon as it is released.